The human microbiome – an ecological community of trillions of bacteria that inhabit our bodies and outnumber our own cells by three to one – have caught the imagination of biologists in the past few years. These micro-organisms coexist symbiotically with our own cells but there is now a recognition that some of them may contribute to certain medical conditions. A research team led by Tina Hieken at the Mayo Clinic has just published a paper in Scientific Reports entitled “The microbiome of aseptically collected human breast tissue in benign and malignant disease.” What they revealed were significant differences in the breast bacteria of women with and without breast cancer. The researchers employed DNA sequence analysis to characterize breast tissue samples removed in the sterile environment of an operating theatre. There were 33 patients – 16 with benign disease while 17 had been diagnosed with malignant tumours – who also had samples collected from the breast skin and via cheek swabs. 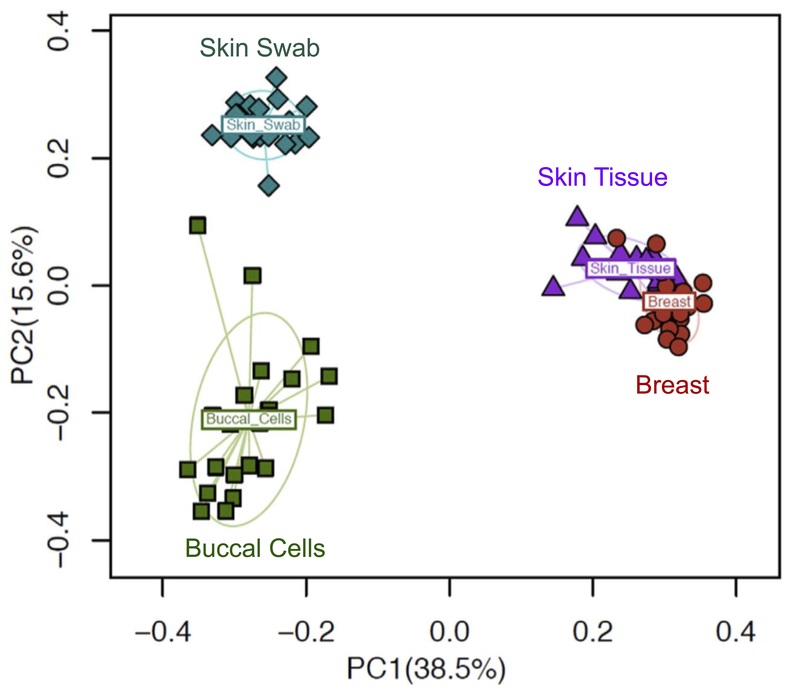 Using principal components analysis, the authors demonstrated distinct clusters of the microbiomes for the different anatomical sites (see diagram below right, © Nature). The micro-organisms found within the breast tissue of women with benign disease were dramatically different to the samples taken from the same locations in women who had cancer. 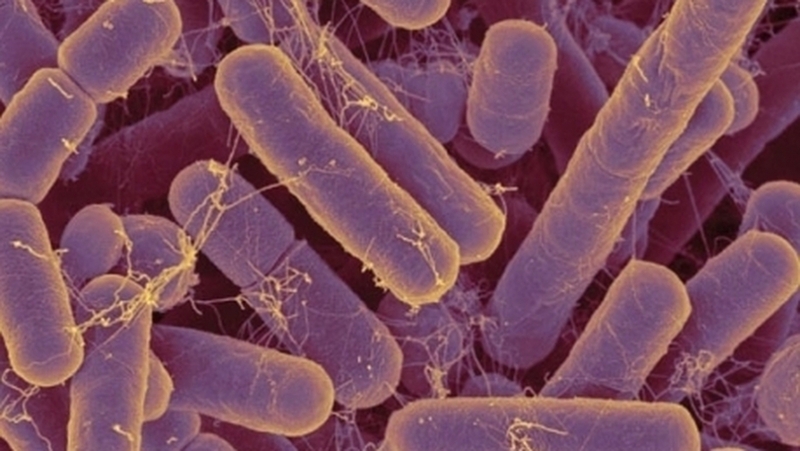 Patients with malignant tumours had an abundance of certain bacteria, including fusobacterium which has been associated with colo-rectal cancer, and lactobacillus – anaerobic bacteria that convert lactose and other sugars to lactic acid. As often happens in the scientific enterprise, research can generate more questions than answers. Hieken speculated, “Could we have a microbial risk-prediction signature? Could we do a better job in predicting risk for individual women?” It seems clear that she and her colleagues will need to increase their sample sizes significantly while extending the analysis to healthy women who have no breast abnormalities. In the meantime, we must wait and wonder about the causative role played by bacteria in breast cancer. “We don’t really know if it’s the presence or perhaps the absence of a certain bacteria that can confer risk or lead to the development of cancer,” Hieken said. “Or is it an entire bacterial community that is required? ”THERE ARE MANY THINGS WE DO NOT KNOW ABOUT BREAST CANCER, AND UNTIL WE DO, JUST FIND THE BREAST CANCER AS EARLY AS POSSIBLE WITH D B T(D 3) MAMMOGRAPHY, SUPPLEMENTED WITH ULTRASOUND, WHICH WILL REVEAL 95% OF BREAST AND TREAT PROMPTLY.